I’ve been wanting to do this for years. But as every summer rolled around and we visited the beach with our family, I’d forget to bring the supplies. Doh. So this year I was determined to make it happen. and the sand of course. I sort of remember using Plaster of Paris back in the day (probably for a Girl Scout project) but I couldn’t remember quite how it worked. Oh yea. Now I remember. You just need a mold to pour the wet plaster into. 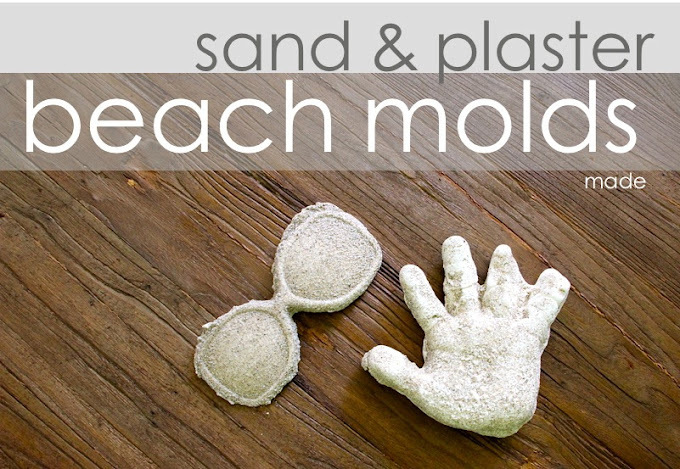 And damp beach sand makes the perfect spot, though you can also use your sandbox or even clay to create your mold. 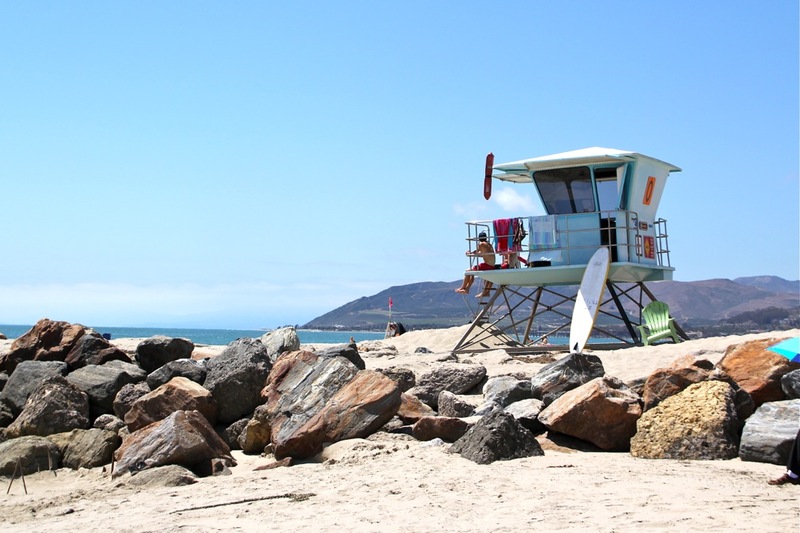 Now aside from the process being easy…I will say that it’s also pretty messy (but hey you’re at the beach). And we also lost a few finished products because some fingers broke off or the tide washed them away. So watch where you create your molds if the tide is coming in. And transport the finished items carefully. • You don’t need a proper measuring cup, just use whatever you have on hand…toys, drinking cups, etc. • Saltwater from the ocean works just fine. • Work in small batches till you find the proper consistency. 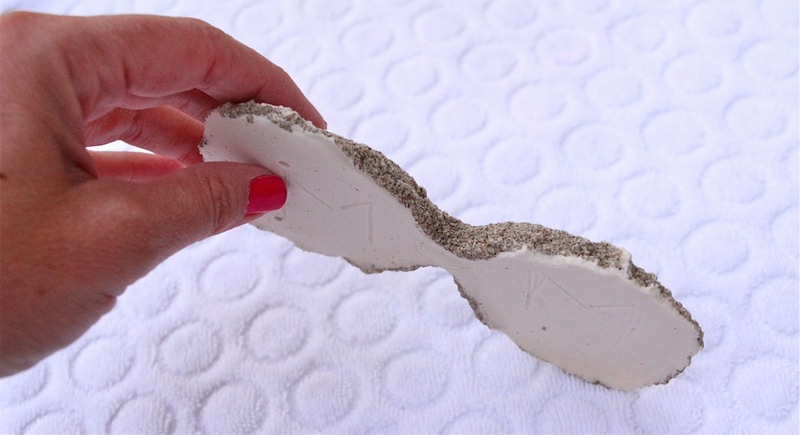 • You don’t want the plaster to be too thin and milky or it will seep into the sand. However if it’s too thick, it will dry faster than you can pour it. Mix it till it’s like a milkshake. 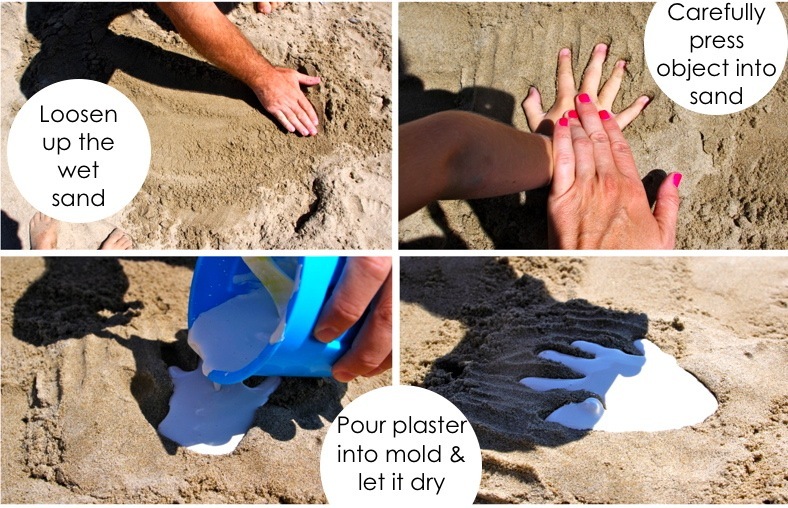 • You definitely need wet sand to create a mold but you don’t want it so hard that a child won’t be able to create a hand imprint. 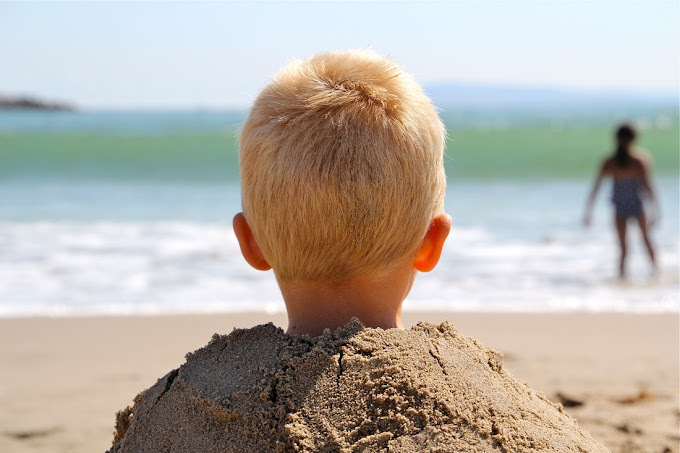 The best sand is right above where the tide breaks. • Loosen up the sand a bit with you hands and smooth it out. Then help your child press their hand or foot or face?? into the sand and carefully pull it back up so the mold is as precise as possible. 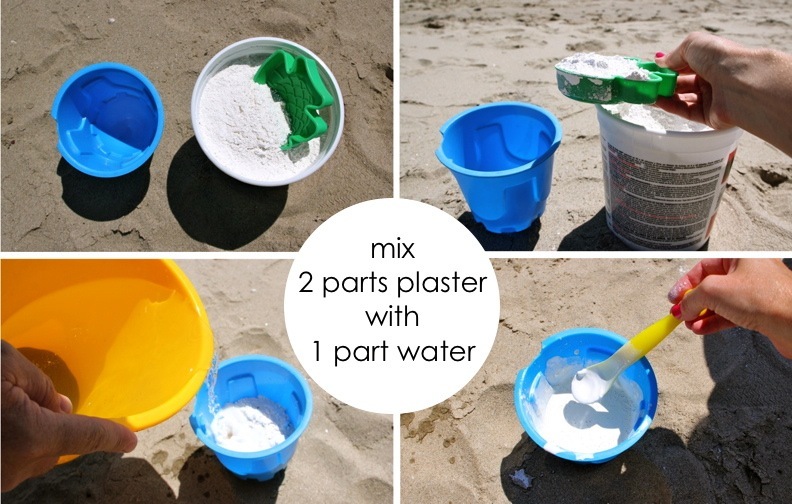 • Work quickly to pour the plaster into the mold. Try not to leak any plaster outside of the mold. 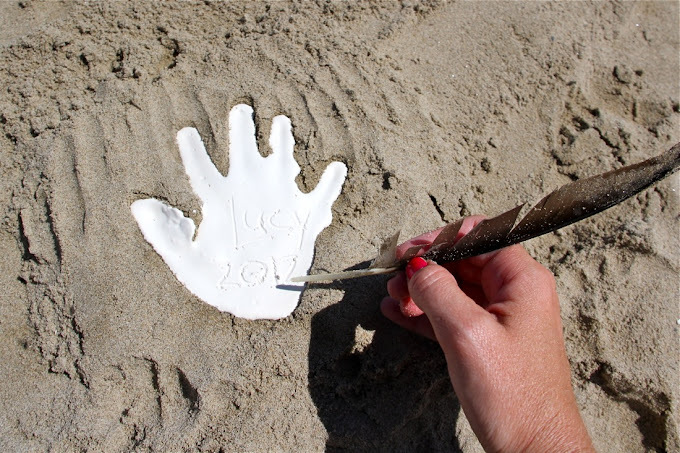 When the mold has dried for only 5 or 10 minutes, use a feather or stick (whatever is around) to inscribe your child’s name and the date on the back. 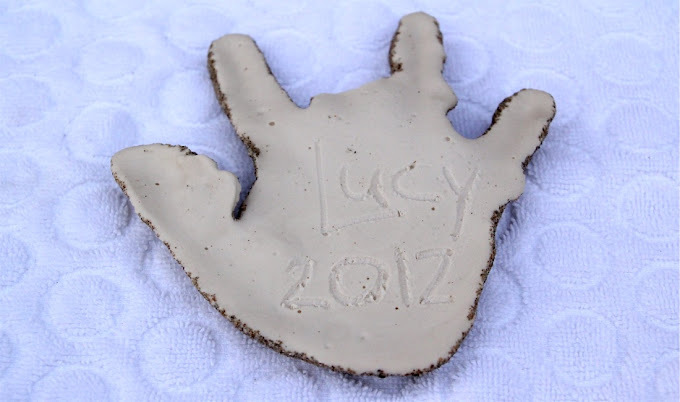 You could make this an annual tradition, capturing your child’s growing hand from year to year. 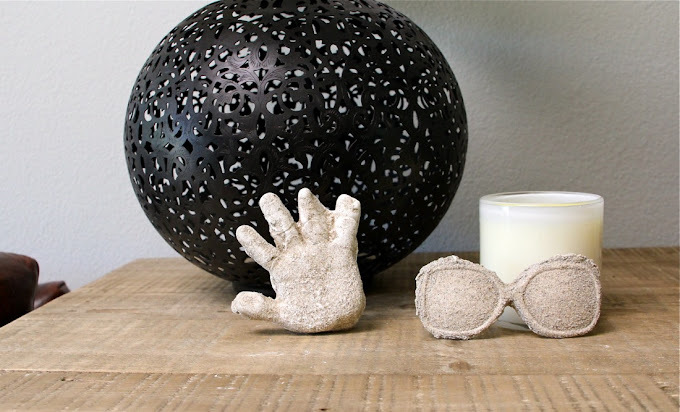 The plaster molds make cool artwork for you home or beach house. Or give one to a Grandparent for Christmas. Make paper weights. Shadow box art? There are many possibilities. 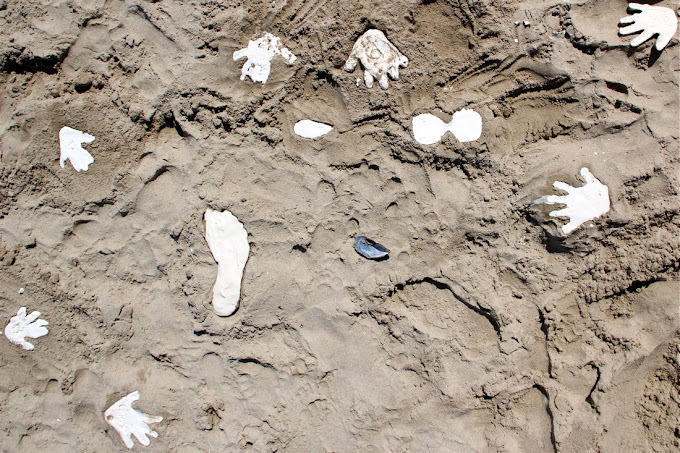 While the plaster dries, enjoy the other beach amenities. Then after about 30-40 mins, the plaster molds should be finished! • Wash the molds off in the ocean and admire your amazing art. • Place them in a safe place near your other belongings. You may want to bring a cookie sheet or pie pan with a towel inside to transport the finished molds. 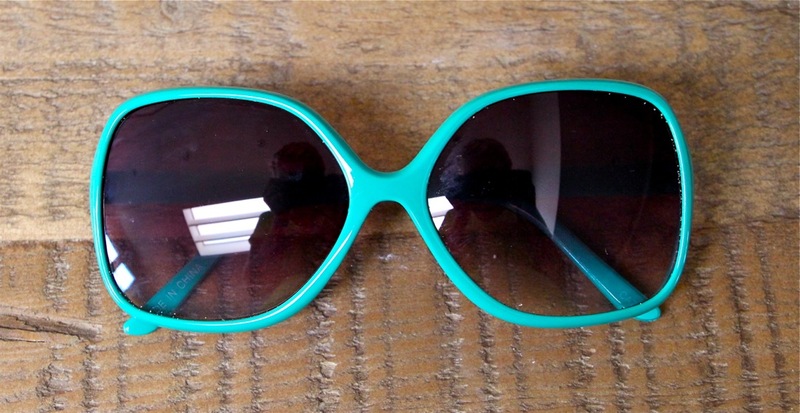 This will prevent them from getting stepped on and they can continue drying. 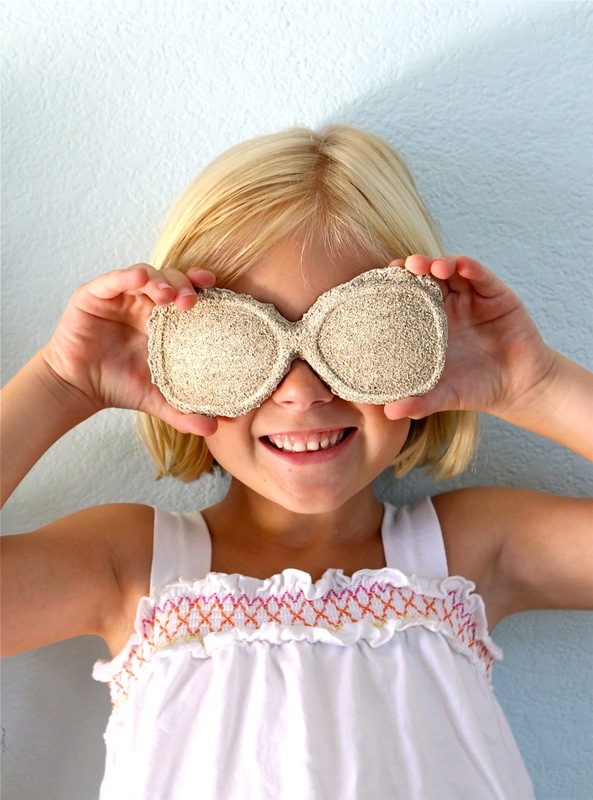 • When you’re home, you can remove excess sand with an old toothbrush or cleaning brush. Just work carefully to avoiding breaking any plaster and don’t brush off all the sand. That’s the charm! 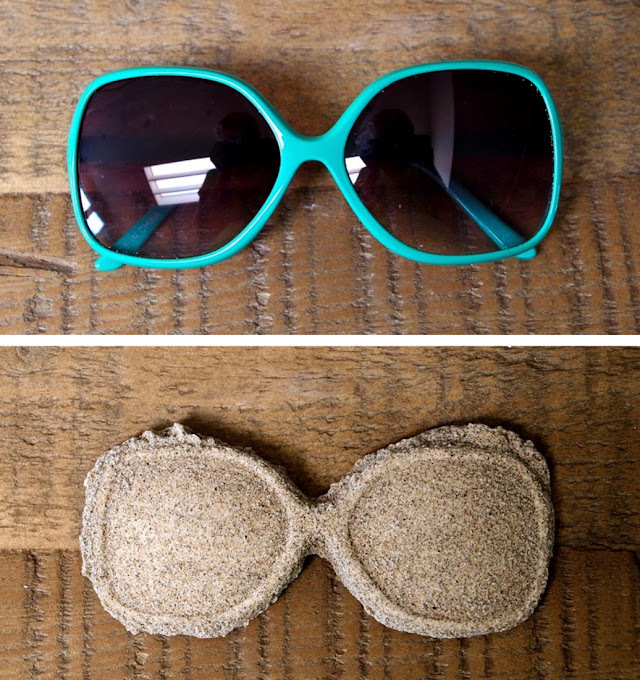 From glasses to beach art. Then find a cool place for your souvenirs, on or off the shelf. This is such a cool idea! I think I need to go and buy some plaster of paris 🙂 Thanks for sharing! I am definitely going to try this with my kids before they return to school. I love it! Thanks for the idea! We did this at the beach too!! We also put small sea shells and cute rocks in our handprints before we poured the plaster. That’s just what I was going to suggest, Lauralee! Love it!!! Thanks for sharing! We are headed to my parents house in Florida in a couple days! It will be a great activity for the kids to do with their Grammie. Lucy’s hand print looks like a ‘hookem horns!’ sign! …. um kind of. 🙂 What a clever idea! That’s such a fun idea! Now if I could just get to a beach :). This sounds like a great thing to do with my kids when I take them to the beach in September for the first time. A great way to remember the trip. 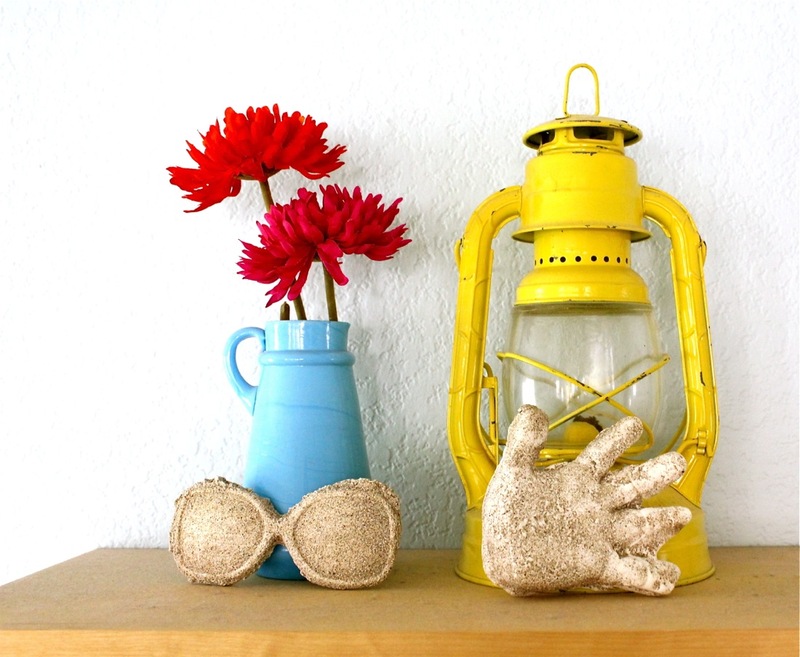 what an adorable keepsake! I love the beach. I don’t love swimming in it! 😉 But all the other ‘amenities’ are a favorite. I hope I remember to make these treasures the next time we go. Oh we used to do this as kids in church summer camp! I totally forgot about this. Thanks for the great idea! I think I need to do this with my kiddos. Super cute idea! I’ll have to remember this next beach trip. What a fun idea! Maybe our MOMS Club will have to try this! 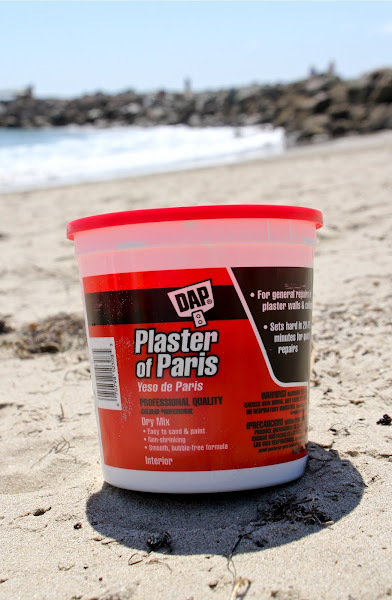 Must remember to take the plaster of paris to the beach next time. Can’t wait to try this out next week at the beach in Michigan! in this area to solve my problem. Maybe that is you! Book Signing recap and finally, going home.